The Cosatto Fly Pushchair is your lightweight 2 in 1 travel system for when you’re on the fly. Suitable from birth, with all the portability and compact curved appeal of your favourite ergonomic pushchair without any lifting off units when you want infant car seat carrier mode. Pram/push chair in great condition. Please see details in photos. Regular signs of use doesn’t affect use. The best quality pram I’ve ever used. Have original box and carry cot in immaculate condition.Comes with rain cover, changing bag and changing mat. Very Study and spacious. Adjustable and both way facing. Collection from Solihull B92. Any questions welcome. Cosatto giggle 2. The buggy fitting. & the Carseat fitting. The buggy fitting can be attached to be forward facing or rear facing. It also has multiple sitting positions from sat upright to flat. Cosatto Woop Nightbird WARRANTY 12 MONTHS! Cosatto Woop Nightbird. Condition is Used. Suitable from birth up to 15kg (3 years spprox.). Head hugger. Fully kitted out with chest pads, headhugger & an extra snug winter-proof footmuff - it’s so cosy you’ll want to climb in yourself. The 3-wheel design with front swivel wheel gives you unrivalled manoeuvrability and pedal braking lets you pause to turn heads (or feed your passenger a chocolate button). Cosatto Supa 2018 Stroller - Dragon Kingdom. Condition is Used. Cosatto supa 2018 dragon kingdom. There is a tiny few marks just under where the pocket flap is on the back of the pushchair from putting it in my husbands boot with work clothes, I washed it in normal fairy but no stain remover! cosatto pram sunny,with raincover and car seat. From smoke free home. Collection. Condition is Used. So many possibilities. Ooba’s your pram, pushchair and car seat carrier(not included), adjusting in over 10 different ways. One simply must push Ooba. Discover yours darling. Marvellously Multitalented – Ooba’s compact folding lightweight chassis is marvellous for ladies who lift. Can be used from birth. I used for my newborn and toddler. Newborn position facing you.Can be used as a twin pram. Very good condition, handle cover has a tear (but it doesn't affect the pram). Immaculate Cosatto Giggle Pram in Pixelate. Rain cover and cosy toes included! The original Cosatto raincover. Exquisite tailoring. KIDDYCOVER & COSATTO. ‘In or out’ facing pushchair seat lets them bond with you or enjoy the view. Deep comfy pushchair seat for a supportive snuggle. Car Seats & Boosters 9mth to 12yrs. Car Seats 9mths to 4yrs. The right to cancel is a no fault cancellation. If the goods are faulty then the standard statutory rights apply. Back Carrier/Baby Carrier/Accessories. Cossatto giggle 2 in Treet design. Comfy for baby. Car Seat padded removable interior section (non matching fabric, but is official Cosatto - see last picture). Pushchair - adjustable angle. Pushchair footmuff which is removable (and in 2 sections so you can go without it, have just the back half on, or both back and front so it's like a wee sleeping bag). Woop 2-in-1 Pushchair (Spectroluxe) byCosatto is a from-birth 2 in 1travel system with built-in pram skills - no need for separate carrycot. Cosatto`s Woop is a combination ofpram andpushchair, no need to buy separates, and can even be used with a car seat. Pushchair seat with in and out facing option. KIDDYCOVER & COSATTO. Want it All?. – Look no further. No need to buy separate carrycot, pram or duo-directional pushchair - Giggle 2’s everything you need from birth till little feet start dancing. The original Cosatto raincover. BEST BITS: Cosatto Giggle Mix. 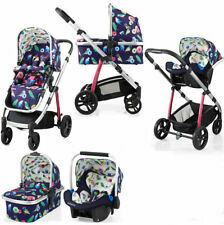 The Convertible Multi-Look Pram and Pushchair.Giggle Mix lets you have it all. 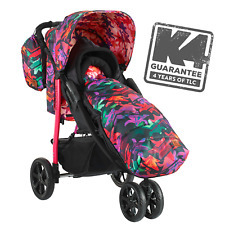 It’s the pattern-changing pram and pushchair that converts to suit your growing child. The Cosatto Wow Pram & Pushchair is your helping hand. Wow is a from-birth hug on wheels for your baby - with all the extras. 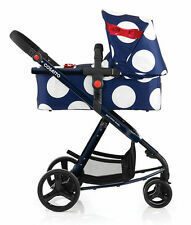 TheCosatto Wow Pram & Pushchair is your helping hand. Wow is a from-birth hug on wheels for your baby - with all the extras. CosattoYo ! 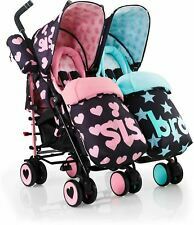 Stroller/Pram/Buggy Special Edition Pow Baby / Child. Condition is Used. In very good condition no stains marks rips functions as it should been superb Stroller. Bit of wear on the tyres but that's about it. This light weight umbrella fold stroller has multi recline for street cruising snoozing and the lie flat option for newborn. Any weather with flappable, zippable cosy toes including summer liner option plus head hugger,chest pads. UPF 50 hood, kit bag / changing bag as shown in photos and rain cover in bag. Super manoeuvers light weight aluminium chassis for hopping on and off the tour bus and lockable front swivel wheels to spin you out of tight spots. Rear lockable brakes. Cosatto Giggle Mix. The original Cosatto raincover. Raincover and padded pushchair Apron. One unit transforms from newborn pram mode into pushchair mode. Space saving. No need to buy separates. Includes hood, pram apron and padded pushchair apron. Cosatto Pram to Pushchair Combi. Comes with Frame, Pram, Pushchair, Matching Cosey Toes for pushchair and nappy bag. Pet /smoke free offers accepted I have to babies who are growing fast and a lot of clothes to get rid of - please see other items. The Cosatto Footmuff warms the cockles of our hearts. It’s literally one huge hug for your dot. It’s custom crafted to fit your Cosatto pushchair perfectly. The original Cosatto raincover. Compact and coordinating. Ooba 3-in-1 (Hygge Houses) byCosatto is alightweight, compact travel system that isversatile ,stylish and functional. Cosatto`s Ooba 3-in-1 travel system just escaped the city and gotnew multi-terrain wheels. 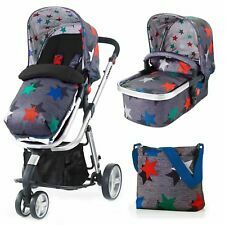 TribeCe 3 in 1 Pram, Cot, Car Seat Used In Very Good Condition only used 3 months occasionally as I did a lot baby wearing. Can be delivered locally if not far. The pram is a bit bulky so you need a big boot to fit in not sure it would fit in a hatchback but other than that I have been very pleased with this, it is very sturdy yet very light I was very pleasantly surprised, it comes with rain cover too and the bar can be switched so baby can face you or face outwards as you wish. Any question please ask. I have other items too check my other listings. Selling a beautiful Cosatto buggy that has been bought from new and used for an Year and a half. In a good used condition however there are scratches on the wheels and on the body apart from that works completely fine. It can be used from birth to 2-3 years. There is a footmoof that’s comes with. A good buggy that will last for a long time. Pick up from the Nw10 area from Shurgard storage. Any questions feel free to ask. Cosatto Paloma Giggle 3 Pram and Pushchair As a new mum Paloma recalls feeling adrift in a world of prams that did not suit her personality. Kindred spirits, they set about designing together. Paloma wanted to show her child it’s “ok to stand out from the crowd and have a joie de vivre about all things.”.